The PADI Open Water Diver course is, by far, the world’s most popular scuba certification course. Learning to scuba dive requires both knowledge development (facts, principles, concepts) and motor procedures (skills, techniques, methods). The PADI Open Water E-Learning provides the knowledge development portion you need. You develop the remaining skills by doing all of the in-water training at Ambergris Divers with our PADI Instructors. After enrolling, PADI’s E-Learning system presents you with interactive presentations that include videos, audio, graphics and reading. Short quizzes let you gauge your progress, and review and correct anything you might happen to miss. This lets you move through the program efficiently and at your own pace. You have unlimited amount of access to the E-Course therefore you may complete the course at your own leisure. What does the E-Course cost? The academics portion via PADI.com “E-Learning” is $184, and is available via the banner link below, this charge is a direct PADI charge that covers the educational material online. This knowledge development training gives you unlimited access to an electronic version of the PADI Open Water Diver Manual (course textbook), vidoes, and all necessary learning tools. 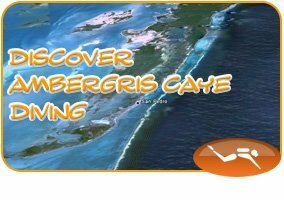 The Ambergris Divers affiliation also has our on-staff instructors available to you for any assistance you may need during this e-learning portion. After the E-Learning Portion How is my Certification completed? After completing the academics portion of the course online you will now be ready for the In-Water Training Portion with Ambergris Divers. This entails 5 confined water sessions which cover the techniques and safety requirements covered in the 5 modules covered in your e-learning academic classes. Ambergris Divers offers our new students a worry free conducive environment to allow you to fully grasp the skills practices. After the confined water sessions comes the very fun part. The Certifying Open Water Dives! 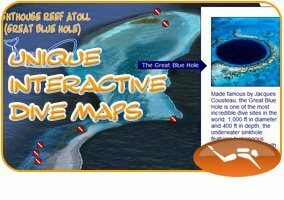 These 4 training dives are carried out at the regular dive sites along the Barrier Reef, so you will get to see the wonderful marine life. Three “1/2” day schedule is provided by Ambergris Divers. What if I have already taken the course but did not affiliate to Ambergris Divers? No problem! We can still complete your In Water Training – in the same procedure explained above. There is only a minimal affiliation upgrade charge of $50usd and we are ready to go! $380 (without Ambergris Divers affiliation).